The Urban Home Tour is the signature fundraiser for the Channel District Community Alliance. Funds raised by the tour will be used for community event and projects throughout the Channel District. The CDCA tries to give visitors a taste of what it is like to live in the Channel District. The Home Tour gives us the opportunity to show that there are many lifestyles and that our neighborhood is a welcoming place to live. Come tour over 10 unique locations throughout the Channelside District neighborhood. Participating retail establishments will also be offering samples and giveaways to attendees. 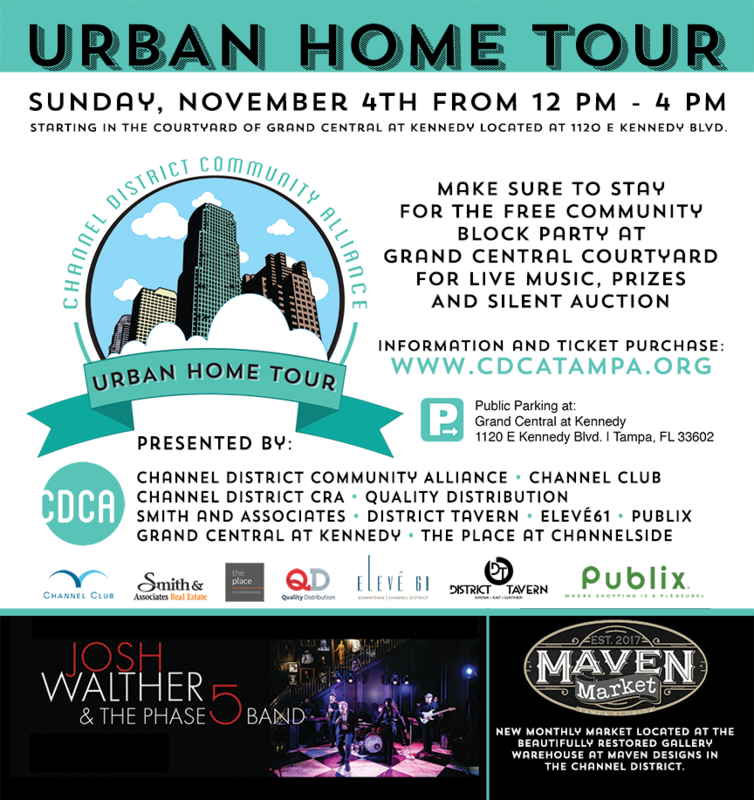 The Urban Home Tour will be followed by an exciting block party in the Grand Central Courtyard featuring live music by Josh Walther & The Phase 5 Band, a drawing for local prizes and a silent auction. Proceeds will be used to support the arts and other community-based projects in the Channel District. The CDCA is the Neighborhood Association recognized by the City of Tampa and is a 501 (c)(3) Not for Profit Corporation. Pre-purchase for online ticket sales has ended. You may purchase your tickets in Grand Central courtyard this Sunday, November 4th.